All Web addresses mentioned were functional as of 9-9-16. From the Cumberland Gap to the Atlantic Ocean, this is Virginia Water Radio for the week of September 12, 2016. This week, we have a special episode written just for Virginia’s fifth-grade science students, about solutions, gases, and aquatic systems. That’s probably a familiar sound to you: stirring chocolate powder into hot water. The stirring dissolves the chocolate into the water, making a solution of a solid in a liquid. Salty water is another example of a solution of a solid in a liquid, and pouring liquid detergent into a washing machine results in a solution of one liquid in another. But what, do you think, is in the solution in this next sound? That was the sound of shaking, then opening, a bottle of soda, creating lots of bubbles and fizzing. Sodas are a solution mostly of water, sugar, and carbon dioxide, a gas dissolved in water that bubbles out when you shake the soda. Where else might you find gases dissolved in water? For one answer, have a listen to this sound. That was the sound of gas bubbles rising from the bottom of a pond. The water in ponds, lakes, streams, rivers, and the oceans contains several kinds of dissolved gases. If you lived in water, what do you think would be the most important dissolved gas for you? Here’s a guest voice to help you with the answer. Oxygen is required by most living things, and those that live in water depend on oxygen dissolved in the water. The number you heard—6.6 milligrams per liter—was the amount of dissolved oxygen in each liter of water measured in the James River near Jamestown on September 9, 2016, according to the Chesapeake Bay Interpretive Buoy system. Different aquatic organisms need different levels of dissolved oxygen, but almost all—except certain microorganisms—require some level. The amount of dissolved oxygen is one of the most important indicators of water quality and the overall health of many water bodies, including the Chesapeake Bay. Finally, here’s a question for you to answer on your own. People can stir drinks to help make chocolate or other substances dissolve, but what kinds of natural processes stir water bodies to help oxygen and other gases mix with the water and dissolve? We close with three more sounds that should help you find a solution to that question. Thanks to Kevin McGuire and Daniel McLaughlin, both with Virginia Water Resources Research Center and the Virginia Tech Department of Forest Resources and Environmental Conservation, for their help with this episode. The pond bubble sounds were recorded at Heritage Park in Blacksburg, Va. (Montgomery County), July 27, 2016. The audio of a dissolved oxygen measurement was recorded from a phone call on September 9, 2016, to the National Oceanic and Atmospheric Administration (NOAA), Chesapeake Bay Interpretive Buoy System, online at http://buoybay.noaa.gov/observations/parameters-measured; 877-BUOY BAY (877-286-9229). The wave sounds were recorded at the Chesapeake Bay on Kent Island, Maryland, June 22, 2010. The stream flow sounds were recorded at the South Fork Roanoke River near Elliston, Va. (Montgomery County), on August 23, 2012. 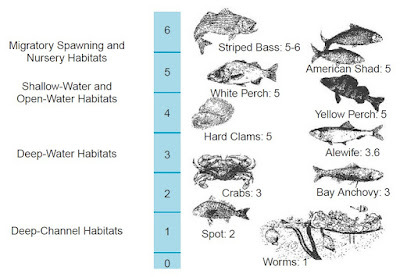 Chart of the minimum dissolved oxygen levels (in milligrams per liter) required by some common aquatic animals in the Chesapeake Bay. Image from the Chesapeake Bay Program, “Dissolved Oxygen,” online at http://www.chesapeakebay.net/discover/bayecosystem/dissolvedoxygen. Excessive growth of algae, such as on this pond in Leesburg, Va. (Loudoun County) in June 2010, can result in low dissolved oxygen levels at night (when the algae, like animals, use oxygen for respiration) or when the algae die and bacteria use oxygen as they decompose the algae. The Chesapeake Bay, Gulf of Mexico, and other many other water bodies typically experience seasonal patterns of excessive algae growth—generated by inputs of the nutrients nitrogen or phosphorus—that may lead to areas where the dissolved oxygen is too low for some period of time to support most aquatic life (so called “dead zones”). Two influences on dissolved oxygen in a stream: heavy algae growth (the dark green on the stream bottom) being decomposed by bacteria reduces dissolved oxygen levels, while flow over the rocky riffle aerates the water and increases dissolved oxygen levels. Stroubles Creek on the Virginia Tech campus in Blacksburg, Sep. 13, 2016. Karl Blankenship, Bay “dead zone” average in early August, Bay Journal, 8/17/16. Chesapeake Bay Program, “Dissolved Oxygen,” online at http://www.chesapeakebay.net/discover/bayecosystem/dissolvedoxygen. Gerald A. Cole, Textbook of Limnology, 2nd Edition, C.V. Mosby, Toronto, Canada, 1979. Fondriest Environmental Inc., “Dissolved Oxygen,” online at http://www.fondriest.com/environmental-measurements/parameters/water-quality/dissolved-oxygen/. Sheila Murphy, “General Information on Dissolved Oxygen,” April 2007, City of Boulder, Colo./U.S. Geological Survey, online at http://bcn.boulder.co.us/basin/data/NEW/info/DO.html. National Oceanic and Atmospheric Administration (NOAA), “2015 Gulf of Mexico dead zone ‘above average’; Heavy June rains, high July nutrient runoff levels likely cause for increased size,” 8/4/15 news release, online at http://www.noaanews.noaa.gov/stories2015/080415-gulf-of-mexico-dead-zone-above-average.html. National Oceanic and Atmospheric Administration (NOAA)/National Ocean Service, “What is a dead zone?”, online at http://oceanservice.noaa.gov/facts/deadzone.html. National Oceanic and Atmospheric Administration/University of Maryland Center for Environmental Science, “Breath of Life—Dissolved Oxygen in the Chesapeake Bay,” May 2007, online (as PDF) at http://www.eco-check.org/pdfs/do_letter.pdf. Linus Pauling, General Chemistry, Dover Publications, Inc., New York, 1970. USGS Water Science School, “Dissolved Oxygen,” http://water.usgs.gov/edu/dissolvedoxygen.html. Robert G. Wetzel, Limnology, 2nd Edition, Saunders College Publishing, Philadelphia, 1983. Episode 250 (1/26/15) - on boiling. Episode 210 (4/21/14) - on solutions generally. Episode 309 (3/28/16) - on temperature regulation in animals, for kindergarten through 12th grade. 3.4 – Animal adaptations to satisfy life needs and respond to the environment. 2.5 – Living things are part of a system; interdependence of living and non-living things. 4.5 – Plant and animal interactions with the non-living components of the ecosystem. 1.3 – How common materials interact with water. 2.3 – Basic properties of solids, liquids, and gases. 6.5 – Unique properties of water – water as a solvent; water in all three phases. 6.6 – Properties of air and atmosphere – air as a mixture of gases. LS.9 – adaptations for living in a specific ecosystem. PS.2 – Nature of matter – mixtures; solids, liquids, gases. BIO.2 – Chemical and biochemical principles of life – water chemistry. CH.5 – phases of matter and kinetic theory – pressure, temperature, and volume; partial pressure and gas laws.